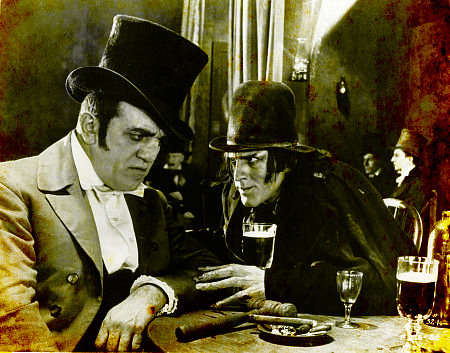 Dr. Jekyll & Mr. Hyde is probably a great movie, just don't watch The Cabinet of Dr. Caligari before this. German Expressionism blows American Horror out of the water. At least during the Silver Age (1915 - 1929), the longest run of great horror cinema. American Horror couldn't keep up with the Germans until the 1930's. Thank you James Whale. Anyway, I digress, Dr. Jekyll & Mr. Hyde is a so-so horror movie. After watching and being blown away by The Cabinet of Dr. Caligari, Robertson’s Dr. Jekyll is just downright un-watchable. John Berrymore is a decent choice to play the bi-polar scientist but the movie just loses steam right out of the gate. Perhaps a better soundtrack or just a more interesting story-line would help. This is where I should tell you that I am not that crazy for Dr. Jekyll & Mr. Hyde. The best part is, we haven’t even begun to scratch the surface of renditions. There are countless. John Berrymore is always a treat, he can really bring a performance all be this one is a bit underwhelming. The costumes, the set-design, the whole thing really has the potential but it just can’t make it out of the gates. The transformation in the movie is amazing. Dr. Jekyll into Mr. Hyde is one of the better transformations and Barrymore didn’t even have to use that much make-up. He is quite the character actor. Watching the film for a second time made me realize that my dislike for the movie comes from the soundtrack. There is no musical change to set moods or even scenes. Long, pointless, songs are played with disregard to the things going on in the movie. This won’t be the last time we see these characters, or John Barrymore for that matter.